Some time ago (okay, over a month ago; ack; so sorry! 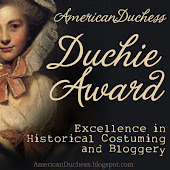 ), I received the Duchie Award from the lovely Lauren of Wearing History! I am always so honored to receive blog awards, but it feels extra special to receive one from someone whose style, skills, and creativity I admire so much! 1. The details. 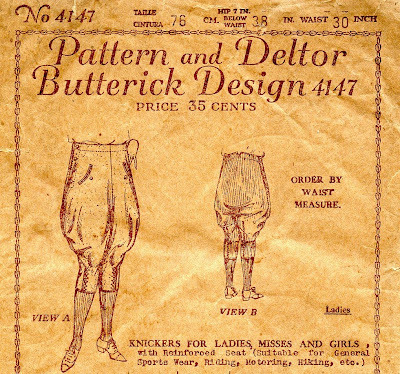 Vintage patterns have beautiful details that most modern patterns just don't have. 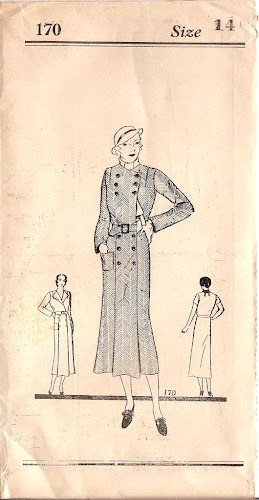 A sleeve from the '30s can have more features than an entire modern dress, and don't even get me started on all of the wonderful seaming and pleating! 2. 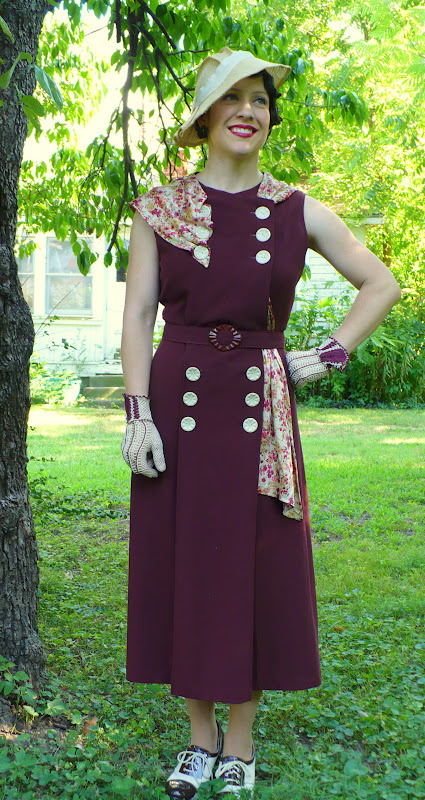 As Lauren said, learning new skills is a huge part of making vintage clothing. 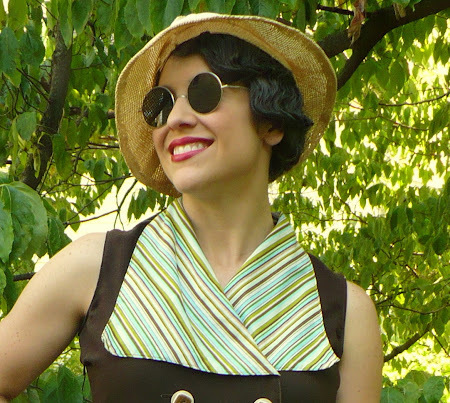 Most of my '30s patterns have very limited instructions, and I am amazed at how far I have come since I began sewing with them. 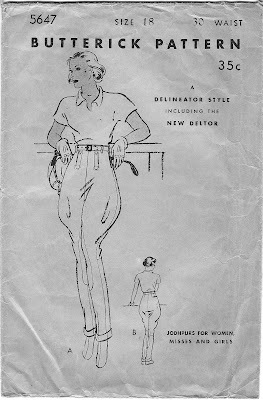 I remember saying things like, "It says to put the bodice together, but it doesn't say how!" 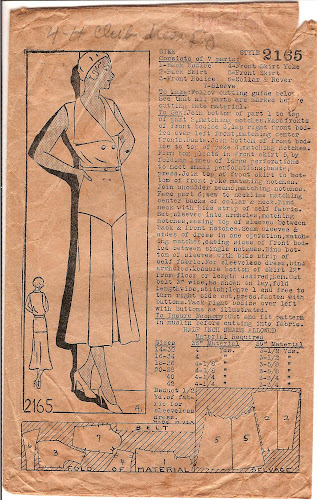 In fact, I just purchased an early '30s pattern very cheaply because its instructions are missing, and I can't wait to get started on it! 3. Dressing my little one. While finding pretty dresses for little girls is not difficult, finding nice clothes for little boys is a different story. They can be had for a price, but even these stop being available after about age 2. If you don't want your little one going around in t-shirts that say something inane like "You Bug Me!" or "Macho Man! ", you must either buy expensive clothes or make them yourself. I haven't been posting any pictures of my little vintage boy, but I have been taking them, so I will remedy that soon! 4. The Accessories. 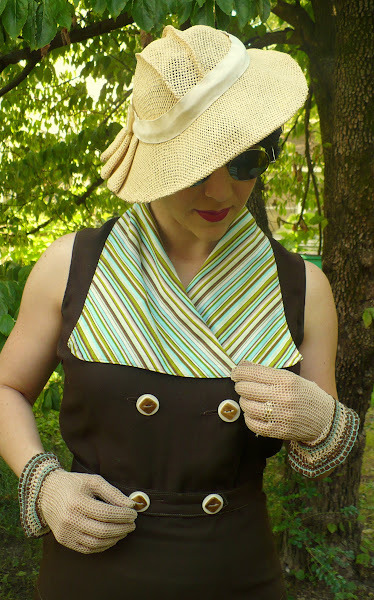 Hats, gloves, collars, cuffs, beautiful jewelry; there is so much opportunity for creativity with accessories. 5.The limitless possibilities. 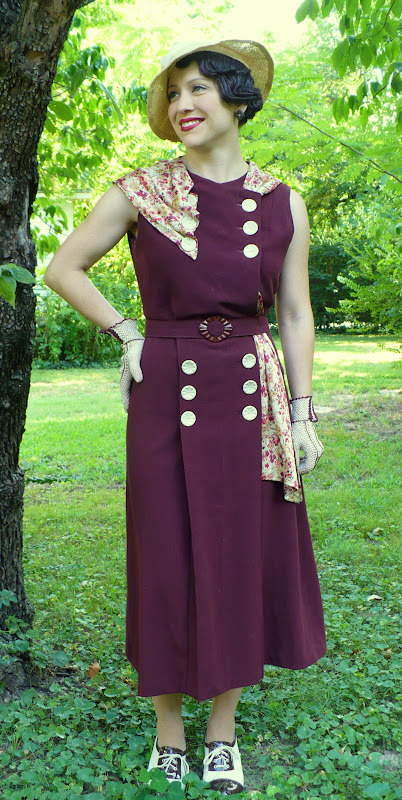 Almost all of my patterns have one or two variations, and I've found that I can make up the same dress using different materials, and it looks like a completely different dress. 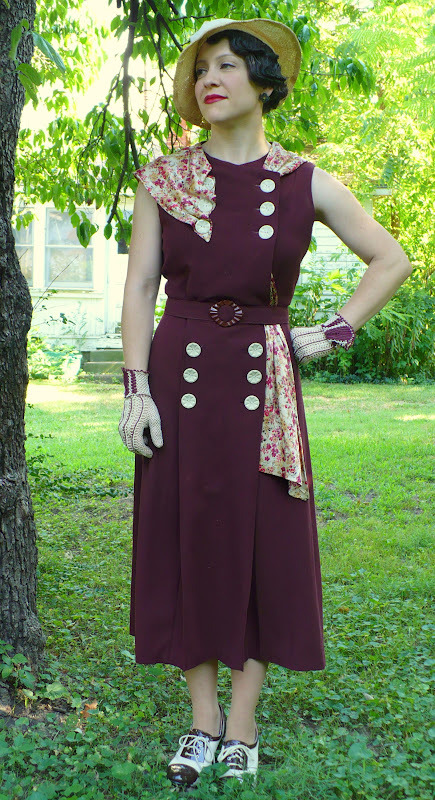 I can't see myself ever getting tired of '30s fashions! 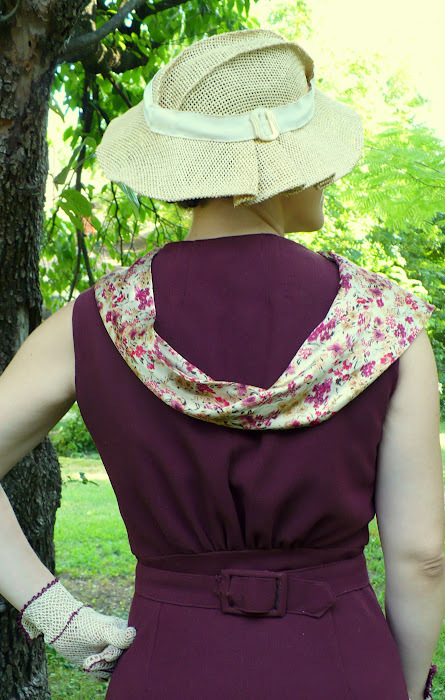 Lilacs & Lace- I first found Laura Mae through Sew Retro, and she makes the most beautiful vintage clothing! 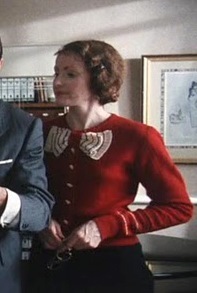 I'll never know how she manages to make so many wonderful garments so quickly! Time Traveling in Costume-I love all of her beautiful creations! 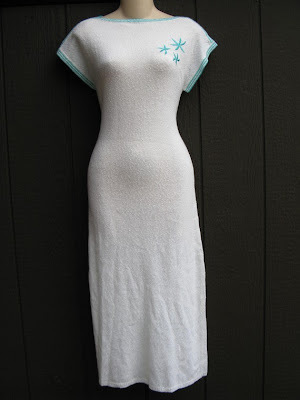 Plus, according to her latest post, she is getting ready to make some dresses from my favorite era; I can't wait to see what she comes up with! My Happy Sewing Place-Debi just celebrated her blogiversery and re-posted photos of many of her lovely creations, which reminded me of all the beautiful outfits she has made over the past year! Thanks again for the award, Lauren! 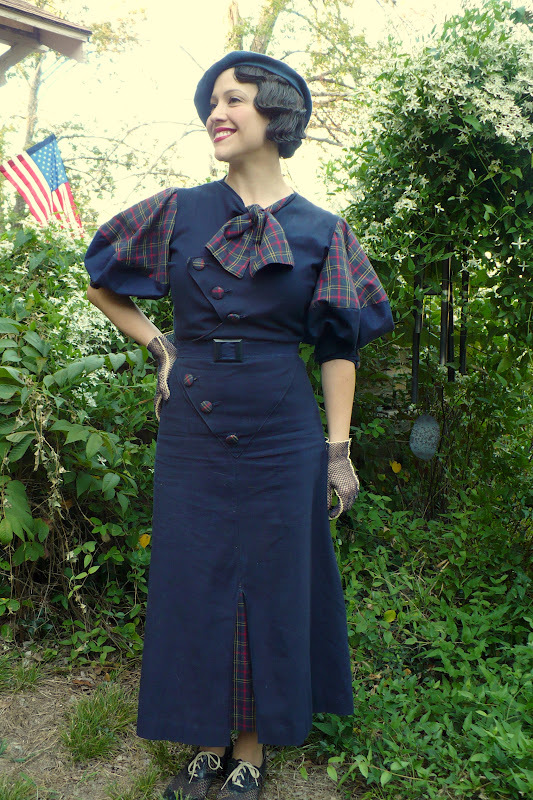 Also, Rhiannon of the lovely etsy shop Garb-oh Vintage has graciously offered my readers a 20% off coupon for Black Friday! 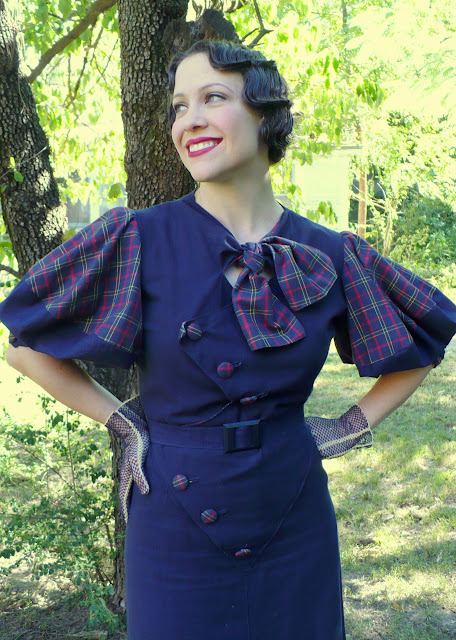 Just use coupon code "SHOPFRIDAY" at checkout to save on some beautiful vintage clothing. 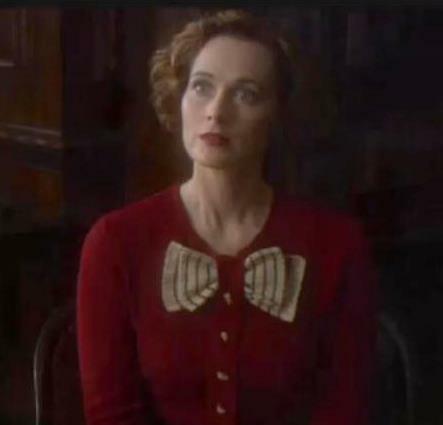 If only the Vintage Baroness and I could have attended the same party; take a look at her ridiculously awesome costume...wouldn't we have made a great pair? 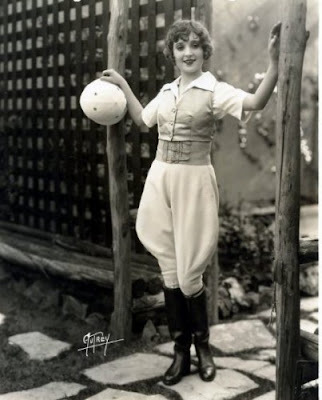 Everyone thought that I was Amelia Earhart, although my original intention was to be Anne Morrow Lindbergh. The fact that a huge number of people had never heard of either woman and had no idea what my costume was supposed to represent was very disheartening. Darned American educational system! There were quite a few children, though, who yelled "Amelia Earhart!" at me, so they must still study her in school (and then forget all about her when they become adults)! 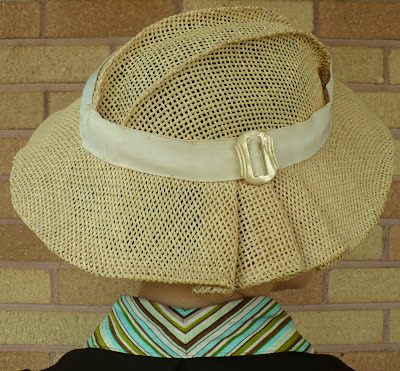 Of course, my ever-complimentary husband decided that I looked like the creepy kid in "A Christmas Story"who stands beside Ralphie in line to see Santa. I found the hat and the vintage welding goggles at a flea market a few weeks before Hallowe'en. I had been planning to make my own hat, but since I found this one, I took the faux leather that I had bought for the purpose and used it on the pants instead. 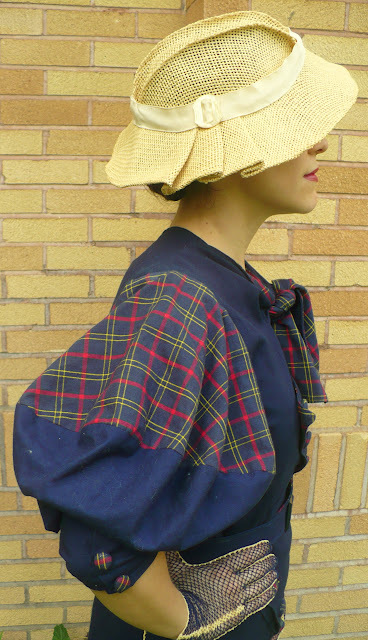 It turned out to be a luckier find than I thought; the coat and jodhpurs took much longer than I had anticipated, so I wouldn't have had time to make the hat anyway! The boots were a lucky ebay find; I had been looking for boots like these for months, and I finally found this pair, reasonably priced and only a little bit too big for me, a few weeks before I needed them. Fate! The scarf is made from white crepe, and the shirt is from Banana Republic via Goodwill. And a good time was had by all! 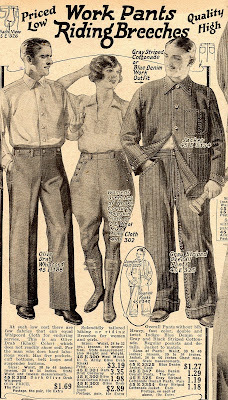 It just about killed me to get a store-bought costume for Henry; I actually have a child's pattern for jodhpurs and a little bomber jacket, and I was planning for us to be Charles and Anne Morrow Lindbergh. Alas, I ran out of time...maybe next year! He's really into Mickey Mouse right now, though, so he was pretty excited to wear this, as you can see! 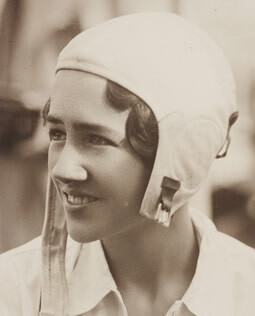 Here is a photo of Anne Morrow Lindbergh. 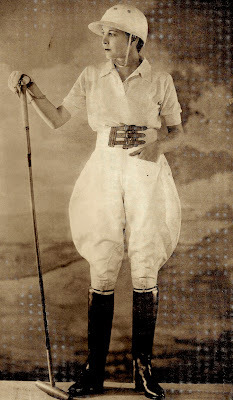 In addition to being a pioneer of women's aviation, she was also a well-published author. Stay tuned for the details on the coat and jodhpurs, and for some pictures of my party! First of all, I want to say how much I appreciate all of your wonderful comments on my last post. I apologize for taking so long to respond to those of you who asked me questions; it seems that life (or as I call him, Henry) sometimes conspires to keep me away from the computer for a while! I want you to know, though, that I always read every one of your comments; I appreciate them so much! It's nice to get compliments from strangers on the street as well, but even when they are very positive, you can see them thinking, "Neat-but how strange!" This leads me into my subject today. A funny thing recently happened to me at the doctor's office. One of the receptionists approached me and commented on how she liked my look. This happens frequently, and it always makes me feel warm and fuzzy! People often ask me questions as well, which I am always happy to answer. However, this time, the questioning culminated in "Can I see your tattoos?!" I wasn't in a hospital gown; I was fully clothed in a sleeveless dress, so I'm not sure where she thought my tattoos were, or if she expected me to hike up my dress to show them to her. I get all sorts of questions, but this was a new situation for me; because of the way that I was dressed, the receptionist seemed genuinely surprised to hear that I did not have any tattoos. 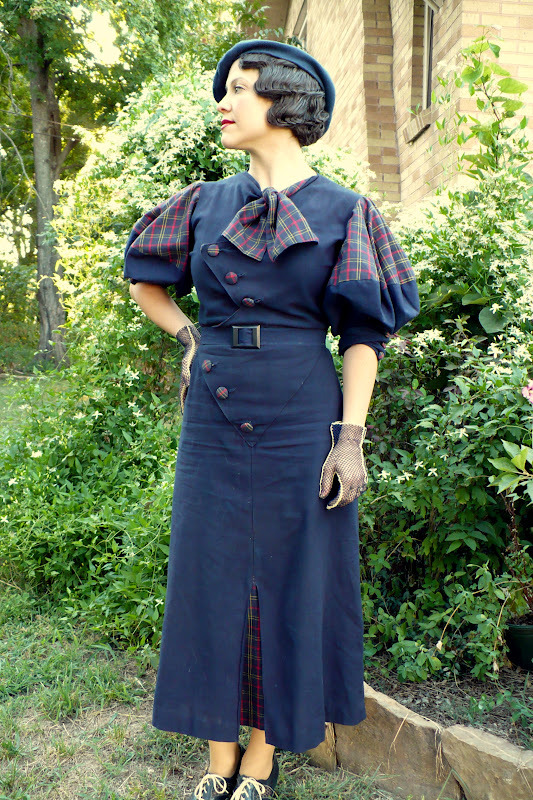 She also told me that she had attended a "1920s style party" where everyone had "Bettie Page waves", so her knowledge of vintage was obviously pretty limited. 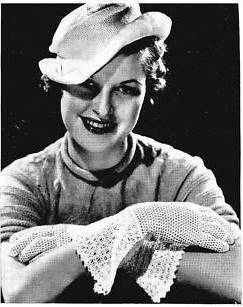 I try hard not to be a vintage snob, because I learn something new every day, but my annoyance wasn't about her lack of knowledge; it was about her lack of courtesy, or maybe tact. I told myself that she must know a person who wears vintage and has tattoos, and so that is the image of vintage with which she is familiar. Even considering this, I think that her asking to see them was impolite. It's like the question that I sometimes get: "Why are you dressed like that?" Even if it is asked in a friendly manner, which is usually is, I just think that there are much more polite ways to ask. I realize that when you dress or act outside of the norm, you must be prepared for some stares, questions, outright gawking, etc., all of which I am quite accustomed to and normally view with slight amusement. However, I think that certain questions, such as ones pertaining to undergarments, possible hidden tattoos, etc, are simply not polite questions for a stranger to be asking anyone. Now, if I had a visible tattoo, I would probably have been happy to show it to her. In the same vein, I get slightly annoyed when someone asks me if my hair is a wig, which happens on a semi-regular basis, and when someone takes my picture without asking me. I think that most of the people who have approached me in this manner would never have said the same things to the "average" person on the street. As much as we try to avoid it, we all infer things about people based on the way they are dressed. I know that I am guilty of it. I'm not sure what I expect people to infer about me...actually, I can think of a few adjectives that I would love to have attributed to me: creative, ladylike, old-fashioned, elegant, etc. :) I'm just not sure that there is anything about my look that screams "Ask me about my tattoos!!" 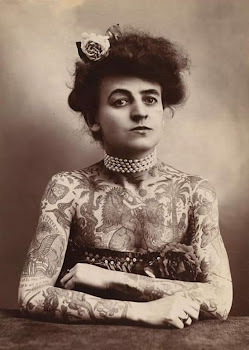 I hope that no one is offended by this post; its purpose is definitely not to criticize tattoos or anything else; I'd certainly be the last person to attempt to make anyone conform to any certain standard of dress! I'd like to hear your opinions; do you think that dressing outside of the norm invites people to behave towards you in a way that they would not behave towards others? What sorts of questions do you get, and do you think that people sometimes feel that they can cross certain lines with you because of the way you are dressed? Sorry for the long post; I just had to vent a little, and I wanted to hear some other opinions. I have another outfit post coming up in a few days! Well, I am shooting for one post per week, so I'm only a little bit behind! 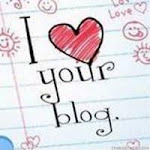 Once again, welcome to all of my new followers; I'm so glad that you've joined my blog, and I'm very thankful for all of your lovely comments on my last post! Here is the back. 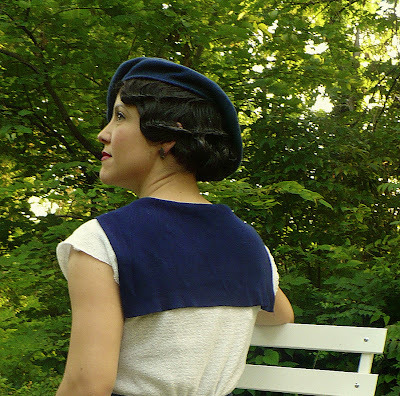 The collar is made from the same cut-up sweater as the hat that I am wearing in the photo below, which I blogged about making in this post. 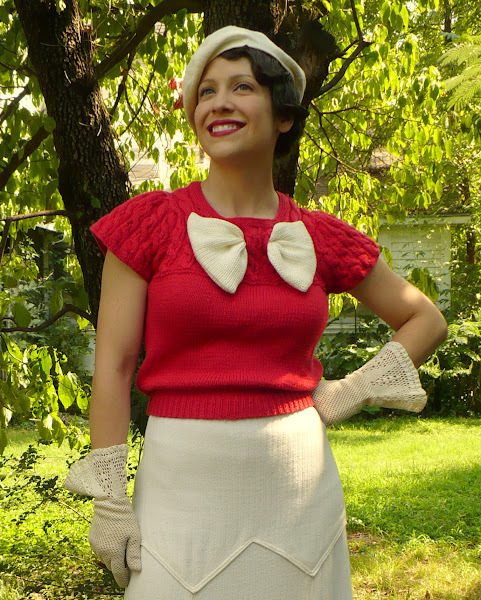 Luckily, it was a rather large sweater, and I used it to make the belt as well! 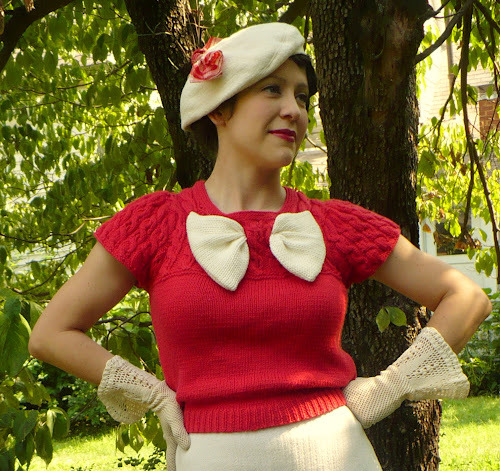 The striped knit is from yet another sweater redo (to be photographed later)! 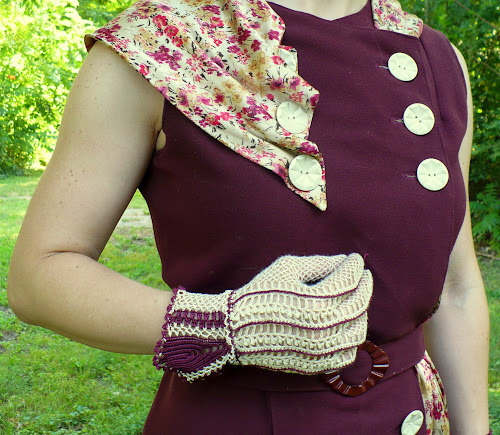 These were actually the scraps from that project, and I was able to make the bow and 4 covered buttons; two for the belt, and two to add onto these beautiful crocheted gauntlet gloves that I got on etsy. Hopefully you can see the jewelry in this picture. 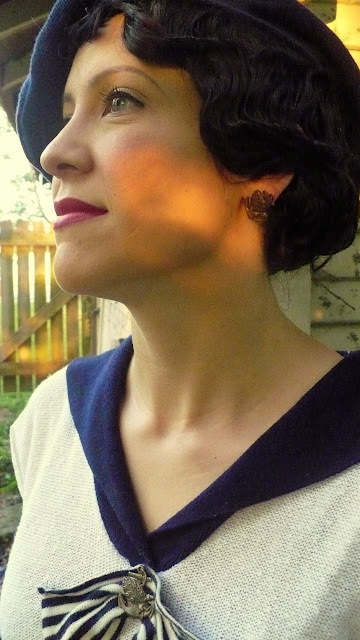 It is a Navy sweetheart pin and earrings set, which belonged to my grandmother. She and my grandfather were married in 1943 when he was serving in the Navy. A little bit later than my chosen era, but I don't care; I think they're perfect! I wanted a white straw hat and couldn't find one at the thrift store, so I had to shell out for a new one. It was still under ten dollars, though! I separated the crown from the brim, cut about three inches off of the height of the crown, wet it and rounded it out, and sewed some tucks down the length to make it smaller and to add interest. This time, though, instead of putting a wire in the brim to change its shape, I wet it as well, and shaped it by weighing parts of it down with books. I wanted to make it look like the brim in this picture, and also as far away from a fedora as possible. I am very happy with the way that it turned out. I stood on a rock for this one (you wouldn't think that grass would grow so well in 100+ degree weather, but you'd be wrong!) so you could see my great navy leather/mesh oxfords! 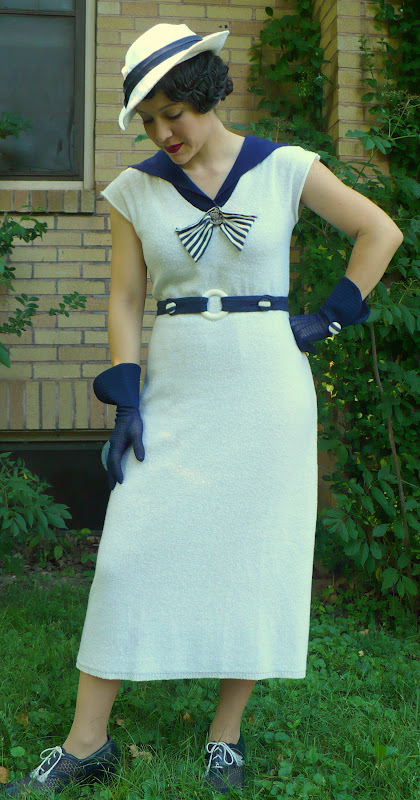 I switched out the original navy laces with white for this dress; the white "laces" are actually made from white cord. Trying to make them look like those beautiful vintage laces, I wrapped them with scotch tape about a half-inch from the ends and then unraveled them. I sort of look like a giant in these pictures; since we don't have a tripod, my husband was experimenting with other objects on which to set the camera...this one was obviously a little bit too low!